I crawled out of my tent at around eight or nine this morning, after a great night’s sleep. Josh was already up, and I joined he, Megan, Harry and Mary on the back porch for coffee. After everybody was up, Mary cooked waffles! There was more good conversation and great company, but I was groggy from sleeping so much and had an annoying runny nose. Megan from Wales had to pick up her bike from the shop early this afternoon, and was planning on a short day, so I’ll probably never see her again. Josh and I were on the road by noon, after packing up and saying goodbye to our generous, most wonderful hosts. Thanks again! 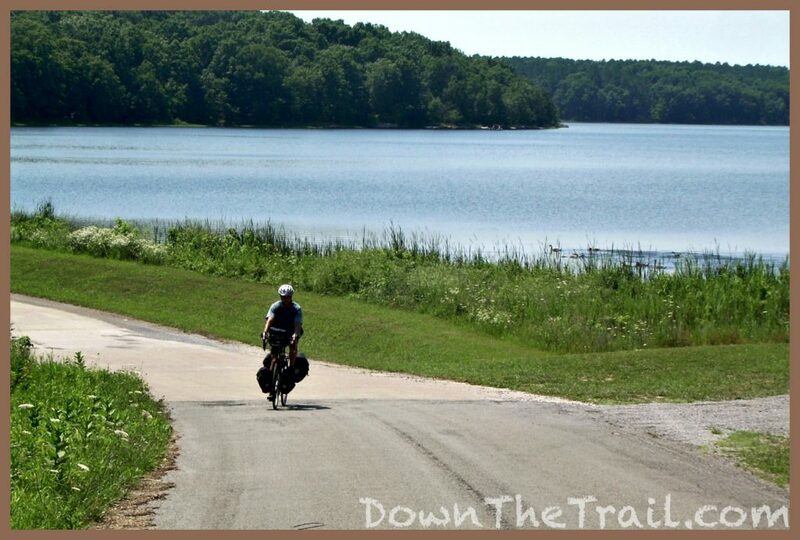 The early riding near some lakes and forestland was good, getting warmed up for the day. 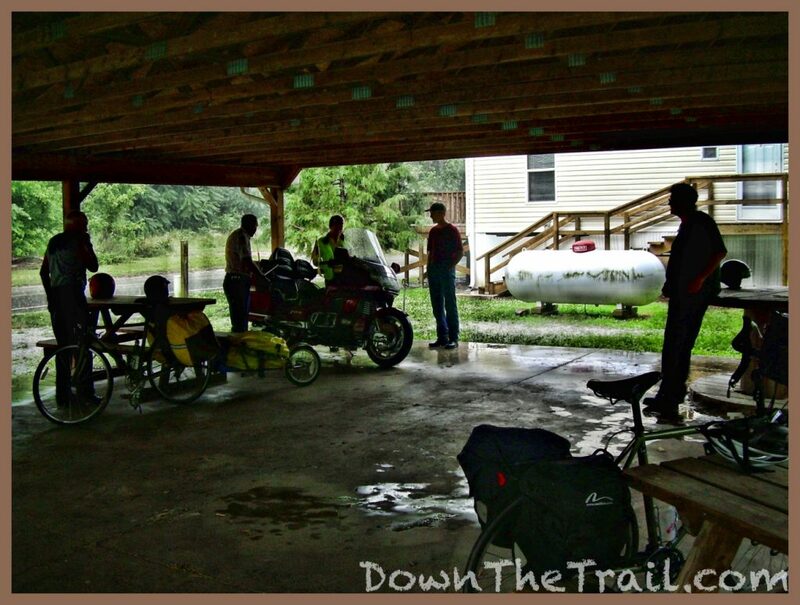 We took a brief break outside a gas station near Carbondale, and moved on to Murphysborough for a more extended break. 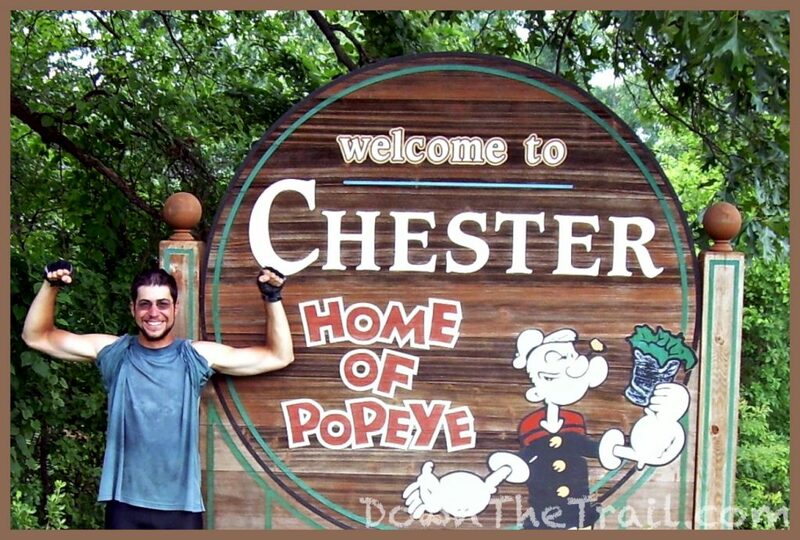 I mostly had Little Debbies, Powerade, and Coke on these stops. The real meat of the day took place in the afternoon, when we rode close to the Mississippi River and followed the levees for some miles. 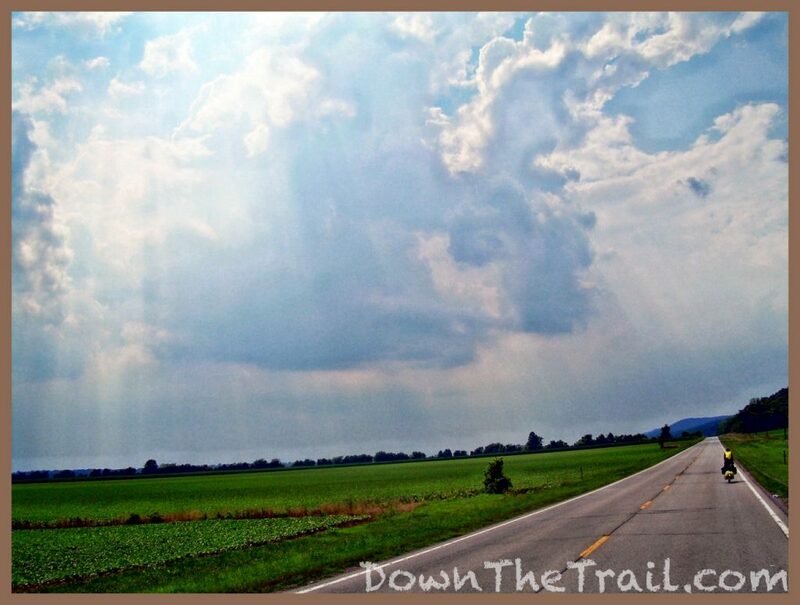 The terrain was flat and open, and maybe we had a slight tailwind, ’cause we were cruisin’! 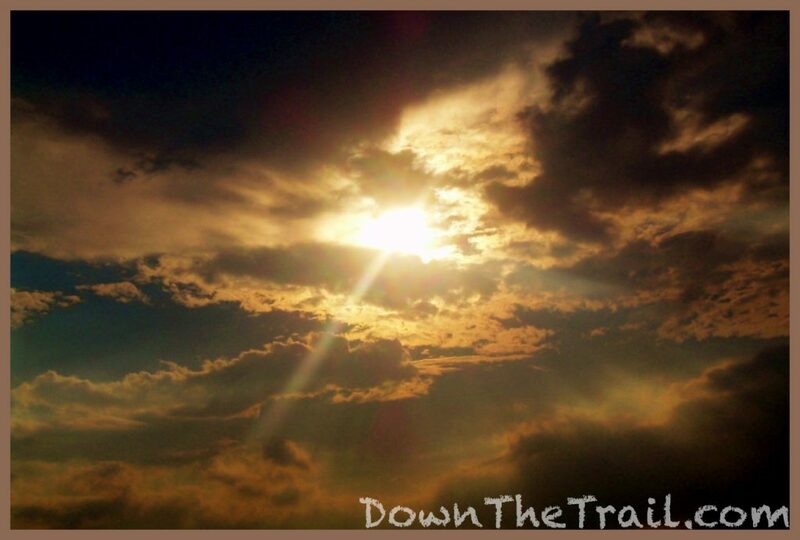 A dark cloud on the horizon caught our attention, with what appeared to be a column of rain beneath it. After some time it came our way. Soon the whole sky was dark, and bolts of lightning could be seen. 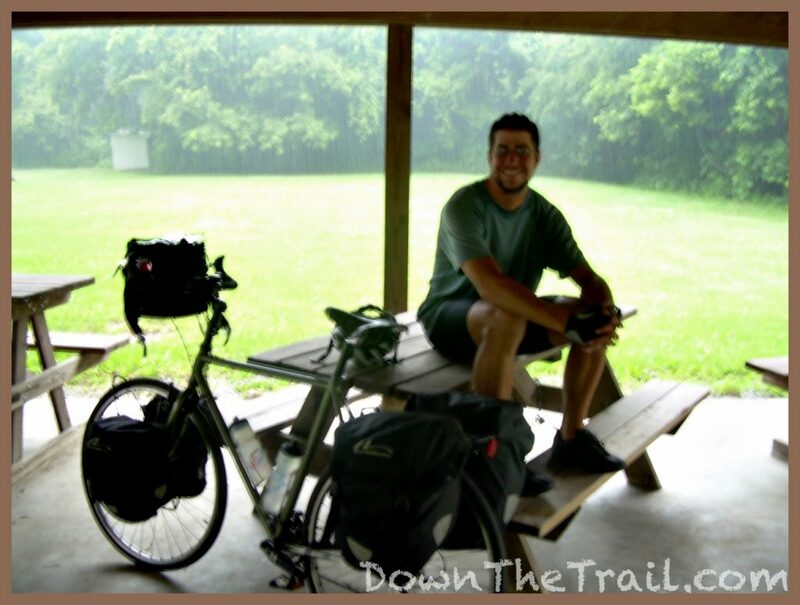 We rode on ahead, looking for suitable shelter as a light rain began. We spotted at a small park with a pavilion just in time, and ducked underneath it only moments before heavy rain began to pour down. It ended up being quite a little party in that pavilion! 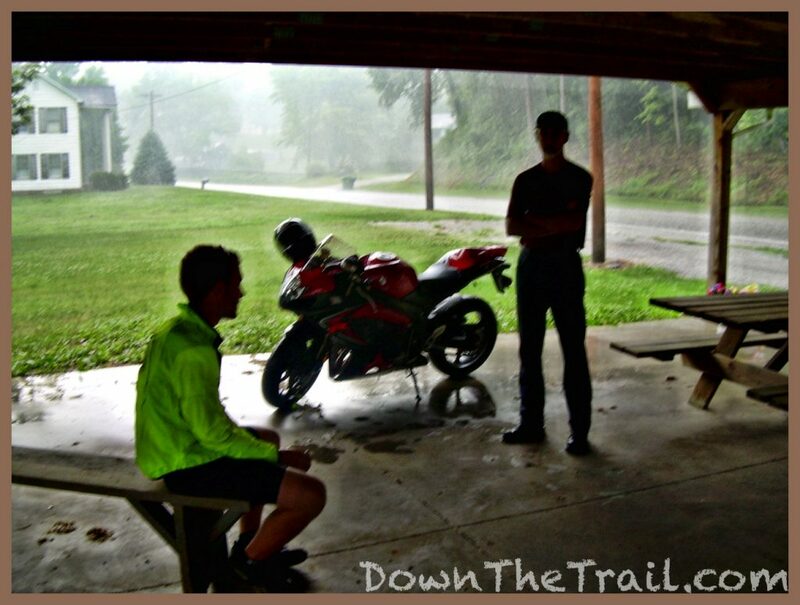 We were joined by four guys on motorcycles – two old guys, and two solo riders who trickled in. The one guy I was talking to said he used to like bicycling, but since having a heart attack and with aging lungs he sticks to the motorcycle. Another guy was really hoping the storm wasn’t passing near his house… he “ripped half of it off” in the process of re-shingling it this afternoon! It wasn’t supposed to rain today, and not for the next few upcoming days, for that matter. None of these guys were as fortunate as me and Josh – they were all thoroughly soaked. 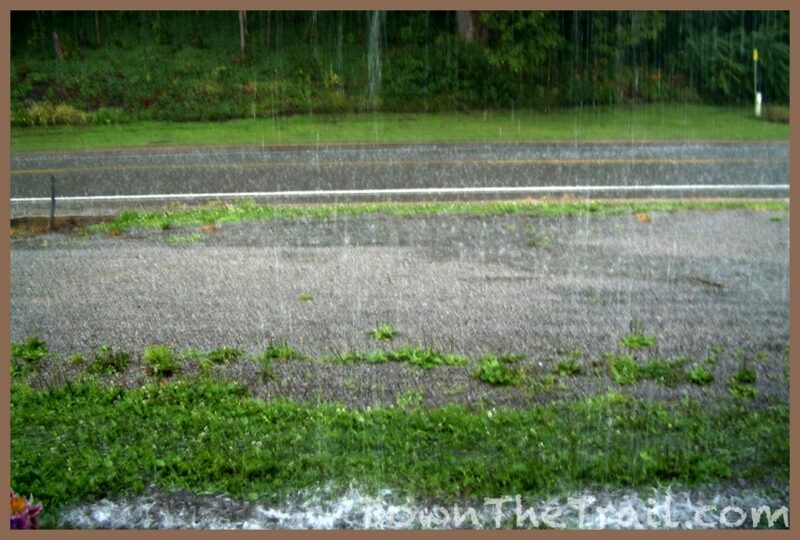 We probably spent a solid hour there, waiting out this freak isolated storm, and got back on the road around 5pm. 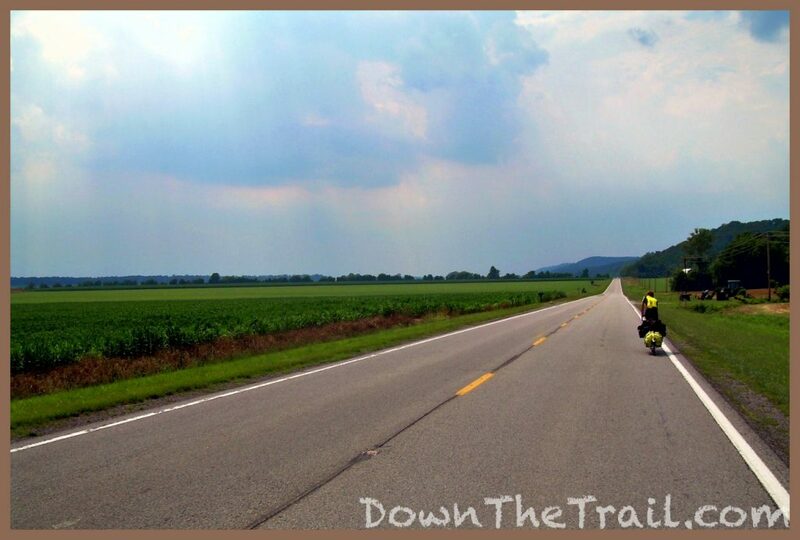 The sky cleared, everything was steamy, and we rode right alongside the Mississippi River! The river is definitely a landmark for me in this cross-country journey. Right now I’m sitting at a picnic bench in a town park in Chester, Illinois. St. Louis is only about 30 miles to the north, but I don’t think I’ll be making the side trip up there. For me the only draw would be the landmark arch and potential photo-op, and I don’t think the traffic, city sprawl, etc. would be worth it. I feel like I’m on a roll now and don’t want to break up the momentum. I’m flipping through the radio stations right now, hearing a little bit of everything – Snoop Dogg, club music, oldies, new pop, etc… all the St. Louis stations, probably. Josh is strolling around talking with people on the phone. It’s kind of amusing hearing him tell the same recent events over and over… I’m glad I have this journal to make it easy on me! 😉 It looks like he’ll be heading up toward the city tomorrow, so we’ll be parting ways. 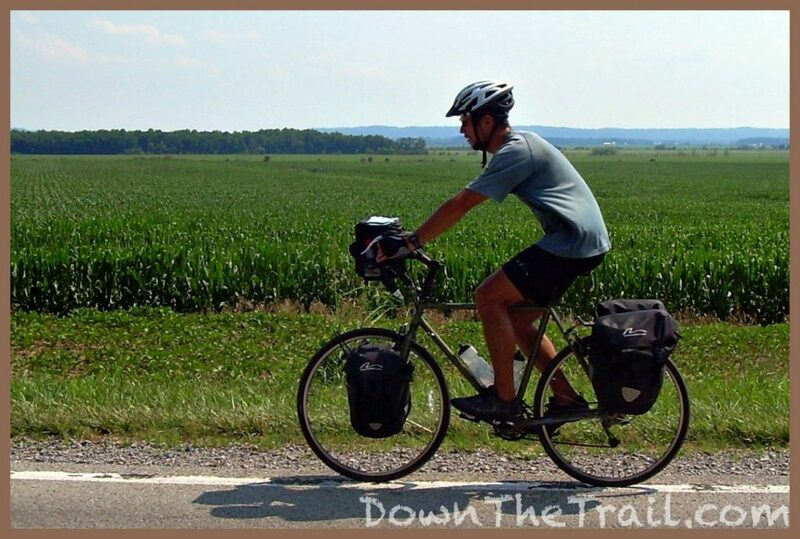 He doesn’t have a specific beginning or end point for his tour, is considering skipping the Midwest, and jumping ahead to ride the Pacific Coast, rather than the Great Plains. He’s nineteen, and it’s been good to have some more youthful company around, especially seeing as how we’re from the same corner of the country. 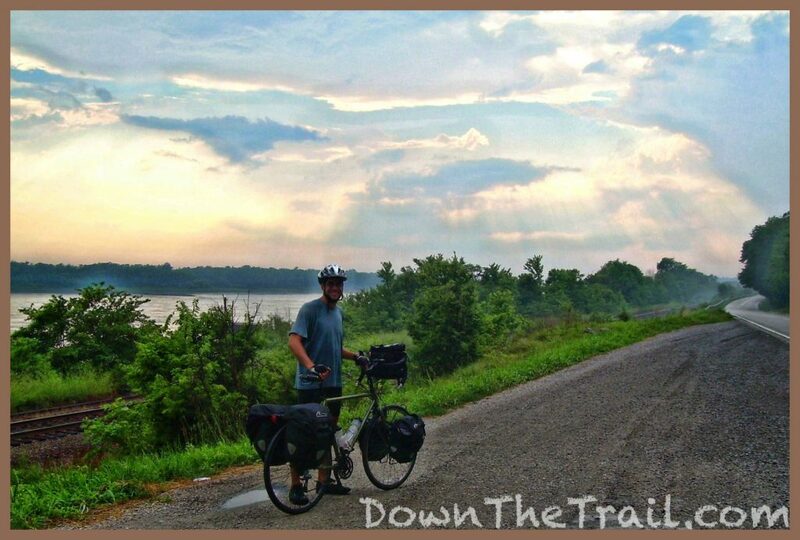 Tomorrow morning I’ll cross the great Mississippi, and enter the state of Missouri! Life is good.